When you have a bright business idea, figuring out what the market size is - and what percentage of that you'll actually get to use your product - is pretty hard. In the dotcom days, the approach always seemed to be "well, there are 60 million people in the UK and 50% of them have dogs, and 50% of people are online, so we have 15 million people who can buy dog food online, so that's our market. And we think we'll get 20% of those in year 1, so 3 million customers in our first year". They call it top down analysis. And it leads to wildly inaccurate results. 1) the PM didn't need, in my humble view, to talk take-up here. He wanted to move the UK on and did so by declaring a vision that in a few presentations at the time I likened in simplicity to the "put a man on the moon, by the end of the decade, bring him back alive" speech. The PM said "get 100% online, do it in a citizen focused way, do it together, all joined up, do it by the end of 2005". Did it happen that way? Not really - but it wouldn't have happened any better, I think, if the PM had said, "get me 100% usage of the top 10 services." 2) the Treasury then took that big picture target and did actually start putting take-up targets on some departments. The Inland Revenue picked up a 50% target. Arbitrary? Certainly. Did they meet it? No. But that doesn't mean it wasn't a valid target - it was stretching, time-boxed, measurable and all of those good things. And, more importantly, people spent time trying to get it done. 3) One of the interesting effects of the 100% target was that when we took a look at plans for realising the target, they showed gradual delivery of services in 2001, 2002, 2003 and 2004 - and then a sudden ramping from perhaps 10% of service online to 100% of services online in the last year; in many cases, the ramp was in the last quarter of 2005. Lots of things went in the "too hard, think about it later" box and so, it was assumed, pixie dust would be sprinkled, magic would happen and services would go online. It took real work to develop a realistic implementation plan - but that plan was greatly helped by the absence of a debate about which services had to go online. When the answer is "all of them", it's only a question of order, not about whether. On a recent trip to Paris I was excited by the Velibre scheme. 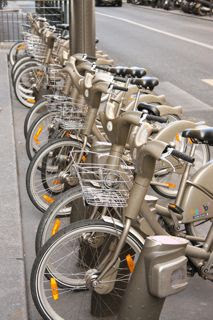 Thousands of bikes spread throughout Paris that you can check in and check out when you need one. You can ride one from Avenue George V to Pont Alma, putting it in a rack at the end of your journey. When you want to go back to George V, you simply take another bike and return it to the original rack at the end. Or maybe you go back by Tube and don't have to worry about taking a bike back at all. A brilliant system. A card reader right by the bike where, if you have a long term subscription (so are local or in Paris often I imagine) you can just swipe the card and take the bike. Back in the early days of direct.gov, we spent quite a bit of time thinking about whether there was a need for a tiered interface - one that dealt with expert users and beginner users quite differently. Various sites handle it now by giving you different entry points - so they have a cookie in your browser and if they detect it when you visit again, they skip all the instructions and go straight to the transaction. That's not quite the same as we envisioned - we wanted content to be greater or lesser based on how familiar you were with the process, how "expert" a user you were. I don't think we ever fathomed a way to do it in a way that made sense and when I look at most government sites around the world now, I don't see anyone else doing it, so perhaps it was a bad idea back then. 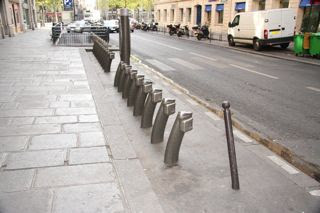 So to see it implemented this way in Paris was a pleasant surprise. That said, I saw many people turn away from the Velibre console, baffled by it - as was I in the first place, because I looked at the second screen (on the reverse of the post) only and couldn't see where I was suppose to put my credit card. I wondered how the business case for the Velibre system looked when they presented it, presumably to the Mayor of Paris. It would have been fun to listen in to. "So we're going to buy 3,000 absolutely identical bikes. And we're going to build racks for them where cars normally park, so they'll be fewer parking spaces. And we're going to let people rent them. And if they use them for a 1/2 hour or less we're going to make it practically free. If they use them for longer, then we'll charge them a few euros, maybe 20 or 30 at most, for a whole day"
"But where will the cars we displace park? We don't let them park illegally now you see. And what about the bike stores - won't they complain about lost sales? And who's going to handle the service and maintenance? And what about vandalism? And what happens if someone gets a puncture on route? And won't that mean fewer people use public transport? But what about when it's raining? What would the liabilities be if someone were hurt"
I suspect all of those questions had really simple answers. More bikes on the street means less people using cars, means less need for spaces. Giving people the chance to ride a bike in the centre of town probably leads to increased sales for those who want to ride elsewhere, the bike shops probably saw business grow. There's a maintenance contract in place. Vandalism seems to have been a non-issue - I wonder whether there were cameras positioned near each rack, keeping an eye on them. And so on. And market size? Who knows. I saw full racks and empty racks. I saw groups of 6 or 7 people coming together, all renting bikes and cycling off together. I saw tourists in 2s, 3s and 4s picking up bikes and taking off to see the city. I even saw a couple of guided tours where most of the people were using Velibre. Certainly if you sit at a table in a pavement cafe, perhaps by the Rue De Rivoli, within 10 minutes you'll see 30 or 40 bikes from Velibre pass by. From everything I saw, the metrics looked good - they'd taken a visionary punt with an idea that I can imagine took some tough selling; executed it brilliantly (sample of one, on one day) and had been rewarded with enormous take up and lots of very happy looking people cycling through Paris. The proposition is simple and elegant though. Try a bike, take a look at our city, pay not very much money. Want to go to work by bike? Fine, take a bike, leave it near your office in a rack that we've handily positioned. Want to go out for a drink tonight? Fine, cycle to the bar, park the bike, leave it behind and get a tube or a taxi home. Absolute genius. In e-government, we all had bigger than probably justifiable views on what take-up should be. I was probably the first dummy that thought a million self assessment registrations was viable within the first couple of years. In hindsight, the proposition wasn't simple and elegant enough. Visit our website, sign up to this, wait a couple of days, now fill in this complicated form using data pulled from all kinds of places that you've probably forgotten existed or never knew you had. No wonder take up was low to start with. It's risen dramatically since then - as has take-up for a variety of services. There are still mountains to climb. I wonder whether any government, anywhere can claim 100% usage of its online service (i.e. 100% of the target market or, perhaps, to be a little fairer, 100% of the online part of the target market)? But I look at Velibre and I'm pretty sure that 100% of its bicycles have been used and that, better still, it has created a market far bigger than its original expectations - and so had a variety of additional payoffs (dare I say healthier people, happier tourists, booming business for bike shops?). So, be bold. Be very bold. A vision needs to capture the hearts and minds of people, inside and outside of your own organisation, government entity or department. If we had our time all again, I wouldn't change, for a second, the "get it all online" message. Seems both naive and arrogant that a bunch of ABC1 white guys could second guess the needs and wants of the population that buys red-top papers. Getting Wayne and Waynetta to change their habits is slow, hard and expensive if not impossible. Putting a man on the moon didn't need all of America to participate, in fact very few. Getting white van man to go online was never in your gift to give! slow, hard, has been expensive but need not be so in the future. but i don't agree it was impossible, or is impossible from here. thanks for taking the time to comment so politely. but isn't it true that Wayne and Waynetta have already changed their habits? they buy online, fly online, sell online, talk online and take pictures online. it's what they do. amazing what a bunch of ABC1 internet billionaires can get them to do. so what could a government have them do? We should remember that the sale of online is convenience and ease of use. But we should also remember that the majority of the services were badly implemented by the very government who now want us to thank them for making an easier version. The danger is that government will take a lot of very rubbish processes and regulation and put it online and wonder why people are not overly bothered to complete a 10 page complex form online which for many people is harder due to computer use rather than the paper version. The reason (I guess) that Wayne and Waynetta do travel etc online is that it is joined up. You can see all the holidays on offer and book everything from planes to villa to insurance and car all in one place (or not if you choose). The alternative used to be go to various travel agents in the high street. If we look at popular Government online services we see car tax. This is popular because you no longer have to queue at the post office. A benefit by anyones standards. Whereas I already complete the gov forms in the comfort of my own home. So very little value is actually added and hence take up is poor. And while government struggles to focus on targets involving getting services online they have all lost focus on reengineering the processes ad utilizing the technology to remove or reduce the burden rather than change the channel. The trouble is they are so busy doing the former that the later has all but been forgotten. And now there is no money left to do the job properly.